"Masterful . . . Sharp, smart writing and convincing economic detail put this in the front rank of genre fiction." An FBI Agent, disgraced and dead. A Muslim economist, deported from the US and tortured. The world's largest hedge fund, secreted off-shore. A Federal Reserve Chairman who suspects a dangerous connection among themand private investigator Graham Gage, to whom he turns to learn the truth. From New York to Boston to Marseilles to Washington DC, Gage races to expose a economic terrorism conspiracy against the United States, his heart burdened and his work complicated by an uprising in western China in which his wife is caught, by ruthless Chinese business leaders, and by a PLA general gripping the largest army in the world with one hand, and Gage's wife in the other. Underlying each plot turn are questions about the vulnerability of the debt-burdened US economy, the use of mathematical financial models, market manipulation, the use of rendition and torture, US corporate complicity in foreign corruption, and America's commitment to its own values. 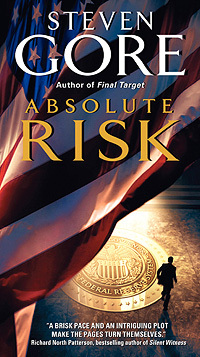 "Vast knowledge of international affairs, economics, politics, and psychology add depth to Gore's second novel (Absolute Risk). The possibility of his plot devices coming to fruition is alarmingly real in today's world. Brad Meltzer and Vince Flynn fans will love this." "Flavorful writing, a brisk pace, and an intriguing plot seem to make the pages turn themselves. Absolute Risk is the work of a talented writer who knows how to hook his readers from the opening line."